We invite you to the Ugly Duckling’s Birthday Party! Please plan to join us on for the HCA-storytelling by Laura Simms and Rolf Stang as Hans Christian Andersen himself! There will be cookies and juice for all children, young and old, provided by the American Scandinavian Society. Storytelling will be held rain or shine. The stories are appropriate for children six years and up. Parents or guardians are asked to sit with their children. 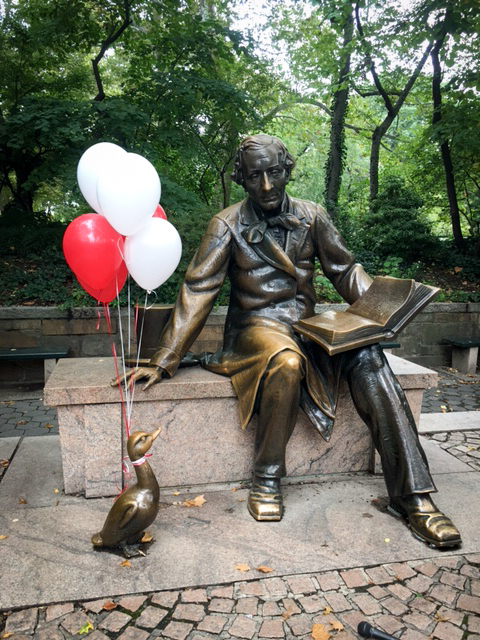 The statue of Hans Christian Andersen is located on the west side of the Conservatory Pond (the small duck & sail-boat pond just north of the East 72nd Street entrance to Central Park). This is the same pond that the statue of Alice in Wonderland stands by. The pond is just at the bottom of the winter sledding hill popularly known as Pilgrim Hill for the statue that stands there.